What does your child want to be when they grow up? Besides “a big kid,” our guess is they may be thinking of a career in law enforcement. So, if they are raring and ready to become a police officer, that is totally great...but they are still a little young to enter into the academy. We know, a toddler always has so much waiting to do! Shorten that wait by letting pretend for now (and what toddler doesn’t want to pretend?). 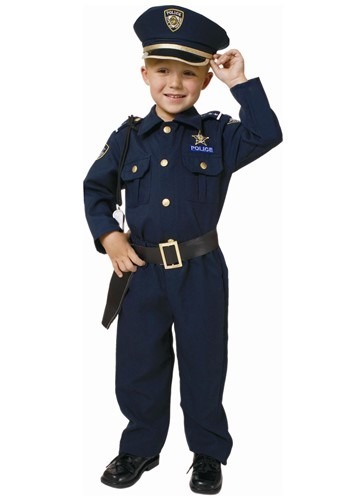 There is no better way for them to practice serving and protecting than in this Toddler Deluxe Police Officer costume because it looks like the real thing! They will absolutely shine with pride when they can come to the aid of the community while wearing it. And we bet you feel pretty great having a little cop in your quarters,too. Your little officer is being kept busy keeping the peace, following orders, and surveying the property, keeping it in check. Wow, that’s a lot for a toddler! You must be very proud. Repay all that hard work with the iconic navy of the police force in this costume, and watch those life goals blossom before your very eyes. This costume has authentic-looking patches, a badge, gold buttons, even white stars on the shoulder! The super-fun police hat and faux-gun holster invigorate all police-y hopes and dreams, but don't be surprised if they still have to take a nap during the day shift; a toddler is a toddler, after all!